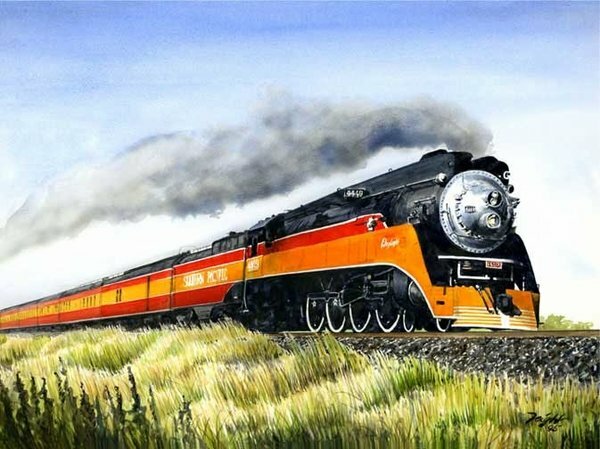 Southern Pacific's passenger service known as the Daylight operated mainly between Los Angeles and San Francisco, CA. The GS-4 streamlined steam locomotive was built in 1941 and operated into the 1950s until it was retired in 1958. In 1974, the 4449 was restored and used to pull the 1976 Bicentennial American Freedom Train that traveled across the United States.Since it was restored to active service in 1976, the 4449 was repainted in its original Daylight colors and has operated on numerous excursion trips and other appearances.